Diceland is a unique concept in tabletop gaming: a quick and physical combat game using colourful paper dice. 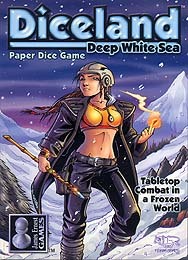 This box contains 25 dice, the complete cast of Diceland: Deep White Sea. Dice land is a war game that instead of using the dice to find out what is going to happen the dice are the game. In simplest terms you throw the dice on to the table and looking at the face that shows and than take an action using that face. Each face of a character has a slightly different ability linked to it. Once you have killed one of your opponents dice you score points for it. This is one of my favorite dexterity games and a nice fun game to start a night of gaming off with. In my experience the game does not last more than 30 minutes once you know the rules. Although the the rules seem to suggest that the game is only for two players I have regularly played with more and it works fine.